This is a partnered post with One2One Network, all opinions are my own. In the United States, there are over 42 million people faced with providing care to their family members or friends every day. Over 42 million! November is National Family Caregiver Month, and what a fitting month it is for giving thanks for those who give so much in order to care for others. Caregiving is a stressful and emotionally draining job that is done purely out of love for another, and those who do it day in and day out definitely deserve some thanks and recognition. In my life I have held a lot of different jobs. One of these jobs was for an organization who provided respite care to caregivers of those with Alzheimer's. Alzheimer's is a debilitating disease that makes caregiving even more emotionally challenging as it progresses. When a caregiver looks at their spouse, parent or grandparent and is no longer recognized, it can make it that much more difficult to perform the functions of a caregiver minute to minute. I watched as the caregivers of these individuals with Alzheimer's gave all of themselves day in and day out, and I know how challenging it was for me to provide respite care for only an hour or two. I can't imagine the burden they felt doing it constantly. Similarly, I watched my mom struggle as a caregiver for my dad who suffered from dementia among other things. He was a big man and did not always have the best disposition. My mom cared for his so selflessly the last few months of his life, and there would never be enough words to thank her for that. Are you a caregiver for a friend or family member? Take the quiz below to find out, you may be surprised by the answer. The AARP's Caregiver Assistance Site has many available resources to help caregivers cope with their daily responsibilities. 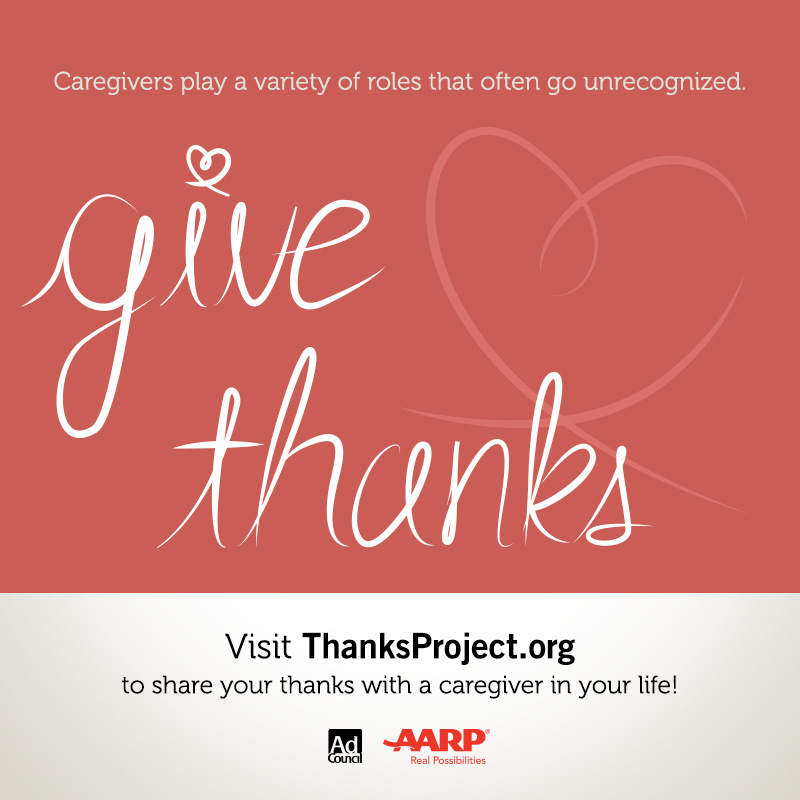 On the new website, ThanksProject.org, you can share a message of thanks with a caregiver you know and post it publicly alongside other messages from people across the country to illustrate the number of caregivers nationwide. A hilarious new video from comedian Jeff Foxworthy who says, “You know you’re a caregiver if…” that you can share with your readers. 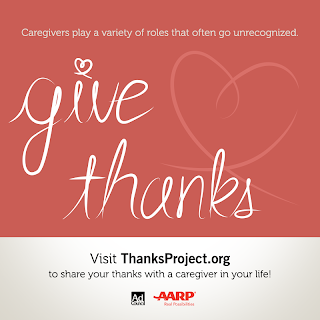 New social media images that showcase the different roles caregivers may play, which you can share across your different social media channels, plus campaign PSA images are available to be shared from AARP’s Pinterest page. Are you or someone you know a caregiver to a friend or family member? What better way to say thanks to yourself or someone else than with a $50 SpaFinder.com gift card? Enter to win using the Rafflecopter below! My mom is for my brother who is paralyzed. I currently care for my mom who is a diabetic, and my coworker and friend Leslie cares for her mom and has for years since her mom has lots of health issues. My mom is the caregiver I would like to say thank you to. I would like to thank my sister, caregiver to our brother-in-law! I would love to thank my mom. She is truly amazing. I would like to say thank you to my niece who is taking care of her father-in-law. Definately my mom! Shes wonderful !! I want to thank my Grandmother. She acts as a caregiver for others even though most people at her age are being taken care of. She also had a career as a caregiver at a nursing home. I want to say thanks to my daycare provider. My husband and I are the caregivers for my mother who has recently moved into our home. I know my husband wasn't expecting to do something like this, but he never complains and without his help, I could never do this. My sis in law who has 3 foster kids! My mom who is the primary caretaker for my Grandma's needs. For my sister, this would be a wonderful thank-you gift for her. I would give this to my mother. She deserves it! I'd like to say thanks to my friend who helps me take care of my business. He's got knowledge and experience I value and respect. my MIL is caring for her cousin right now. I think it's a little crazy the lengths she went since it's a distant cousin who has immediate family, but that's the type of person she is. I don't think I could ever do it.